Hoover is a trusted, well-known cleaning brand, but with so many vacuums for sale, it can be tough to decide which Hoover to buy. Even if you’ve settled on a cordless device to pick up the messes in your home, Hoover has more than one popular battery-powered model on the market. To make your decisions a little bit easier, check out our side-by-side analysis of the Hoover Air Cordless and the Hoover Linx. Cordless vacuums are all about convenience, and these two vacuums are no exception. 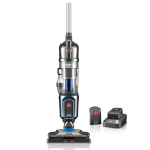 The Hoover Air Cordless Series 3.0 Upright Vacuum is a lightweight, maneuverable device designed for whole-home cleaning. 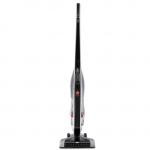 The Platinum Collection Link Cordless Stick Vacuum (BH50010) is a compact device intended for efficient spot cleaning. NerdWallet takes you shopping: The first cordless model in our head-to-head is the Hoover Air Cordless Series 3.0 Upright Vacuum. Currently available for $199.99, this model carries a regular retail price of $299.99. This full-size vacuum is designed to clean an entire home without the user having to plug and unplug the device during room-to-room cleaning. The model’s two batteries deliver an average of 50 minutes of cordless power. When the battery level indicates it’s time to prep the product for another round of cleaning, charging will take about three hours. Weighing in at under 10 pounds, this cordless device is also lightweight enough to transport around the house. Additional selling points include the vacuum’s high-capacity dirt cup, removable cleaning wand, LED headlights and WindTunnel 3 technology that includes three channels of suction. Extras include a 2-in-1 dusting and crevice tool, an additional filter, a hard floor brush roll and a pivoting dusting tool. Good fit for: The Hoover Air Cordless Series 3.0 Upright Vacuum is a good match for homeowners who want a mix between a traditional upright device and a compact, portable vacuum. Its suction and accessories make it ideal for cleaning all sorts of surface types, while its cordless, lightweight design makes it ideal for owners of spacious homes. NerdWallet takes you shopping: Next up is the Platinum Collection Linx Cordless Stick Vacuum (model BH50010), a high-rated cordless and bagless stick vacuum available for $179.99 from Hoover. Powered by a lithium-ion battery system and suited for use on hard floors and low pile carpeting alike, this vacuum features a fuel gauge to track remaining battery life, fingertip power controls and WindTunnel technology. Additionally, the device’s low profile base and reclining handle tailor the product for use under and around furniture. However, unlike the preceding model, the Link doesn’t include headlights or a cleaning wand. But what it may be lacking in auxiliary features, it makes up for in price (it’s more affordable than the Air Cordless) and weight (it’s more than two pounds lighter than the preceding model). Good fit for: When you stack up these two Hoovers, the Linx is a better choice for homeowners — particularly those who live in multistory homes — who want an ultraportable and lightweight vacuum for quick cleanup jobs. Courtney Jespersen is a staff writer covering personal finance for NerdWallet. Follow her on Twitter @CourtneyNerd and on Google+. Top photo via iStock; product photos via Amazon.